What A Brush With SARS Taught A Doctor About Ebola : Shots - Health News A young doctor put on a protective suit so he could examine a man who might be sick with SARS. It was hard to tell who was more frightened: the doctor or the patient. 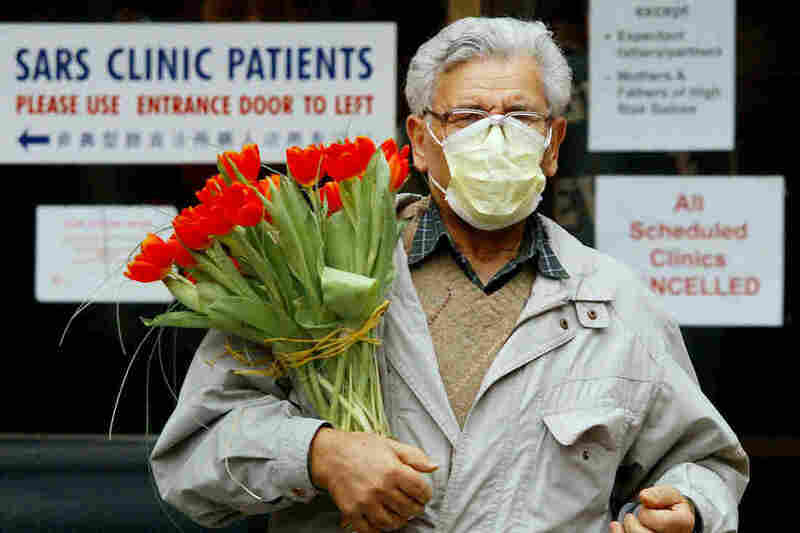 A man wears a protective mask as he carries a bouquet of flowers at Women's College Hospital in Toronto in March 2003, when SARS fears about were widespread. I didn't have much of an appetite for lunch that day, despite feeling like it might be my last meal. At the time, Severe Acute Respiratory Syndrome was killing people, mostly in China. Travel alerts were all over the TV and radio. People, especially air travellers, started wearing surgical masks in public. There were worries that the full extent of the new illness was being concealed by Chinese authorities. Deep skepticism about the country's slow-footed response contributed to a sense overall panic. The SARS-induced dread then was almost as strong as what we have now with Ebola. But unlike Ebola, the SARS virus is spread through the air, which makes it far more contagious. Like Ebola, SARS often kills victims in otherwise good health. We now know the fatality rate for SARS is much lower, less than 10 percent. Ebola's mortality rate appears to be as high as 70 percent in parts of West Africa where the epidemic is raging. But, of course, whether Ebola patients live or die seems to depend greatly on when they are diagnosed and where they are treated. On that strange day 11 years ago, the nurse who managed the clinic showed me where to suit up and then she thrust a memo in my face that detailed what I'd have to wear: a whole-body suit complete with face mask and gloves. I felt like I was dressing to go on an Apollo mission, minus the cool patches on the arms. I'd had no specialized training in how to work as doctor while dressed for viral Armageddon. When I donned the suit, I was immediately hot and uncomfortable, even with the room's air conditioning on full blast. The suit dulled my senses. I couldn't see, feel or hear well. The suit muffled my voice, making it hard for me to be understood. The nurse in charge took me to the exam room in the little-used back hall, all to keep the possible SARS patient out of the way of onlookers and other patients. She left me in there, all suited up and alone, while she went to get the patient. A tall, thin man with John Lennon glasses and a nervous air walked in, wearing a surgical mask. As soon as he'd arrived at the reception area, he'd been issued a mask, something that wasn't unusual during the SARS scare. His fearful gaze showed me that he was overwhelmed. Now he had to submit to an interview and exam from a creature in a yellow spacesuit. "Welcome to Chicago!" I lamely offered, trying to ease some of the tension. Then he told me his story: He was a professor, and he'd been on a trip to Hong Kong, one of the hotbeds of the outbreak. When he returned home to Canada, things there seemed to be spiraling out of control as well. People in his hometown of Toronto were infected with SARS. Some were dying. When his schedule brought him Chicago to give a speech, he became especially worried because he'd developed a cough. His hosts recommended that he go to the medical center right away. His cough was dry. He hadn't been in contact with anyone known to have SARS. He had not had any fevers. I retook his temperature, and it was normal. Fever is one of the key criteria for SARS, as it is for Ebola. Other than emotional heat, this professor's temperature was normal. He had a normal physical exam. Other than his mild cough, I judged his biggest problem to be fear itself. I felt a tremendous sense of relief. I could tell the professor that he didn't have SARS, and neither of us would have to deal with the hysteria that would have ensued if I'd had to put him in isolation. I tore off my spacesuit as fast as I could. With what I've now learned from the Ebola crisis, I know I did it wrong. But at the time I wanted to be able to reassure the professor and shake his hand without protection. At least I washed my hands afterward. Standard operating procedure even then. Not long afterward, the SARS-related hysteria died down. The Chinese government apologized for its early cover-up and took the situation very seriously. Since then, we've seldom heard about SARS, except in comparisons with Ebola and other emerging diseases. But I think back on that day in light of today's biomedical scare. Like the Texas nurses Nina Pham and Amber Vinson who are now Ebola-free, I wasn't fully prepared to confront a highly infectious disease. I was just darn lucky that the patient I evaluated wasn't infected with the SARS virus — or Ebola. Today's Ebola crisis makes clear what the many of us were slow to accept in 2003. It takes clear thinking, painstaking preparation, flawless execution and clear communication to protect the public health.